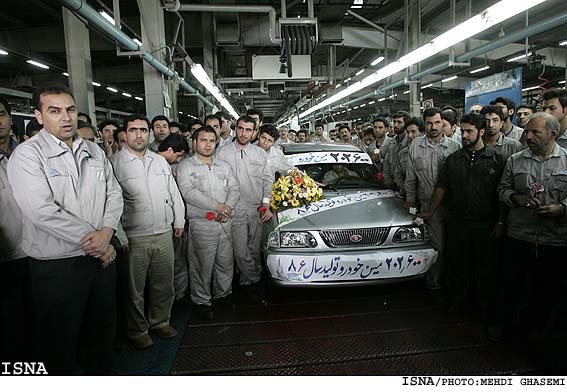 TEHRAN, Oct. 21 (Mehr News Agency) - The growth in Iran's car exports is expected to rise to one billion dollars by the end of the current Iranian calendar year (March 20, 2009). Growth is up 30 percent from $700 million worth of exports a year earlier, the Industries and Mines Deputy Minister Ahmad Qalebani said here on Tuesday. Addressing the First Conference on Innovation in the Automobile Industry in Iran University of Science and Technology, Qalebani stated that 75 percent of automobile parts are domestically manufactured and exported, "whereas, until a few years ago we imported the material needed to manufacture car parts." "We also design automobiles and engines," he noted. The official called for more innovation and creativity. "The automobile industry needs further innovation and creativity for a strong, constant, and dynamic presence in international markets and appropriate profit-making through exports." He also stated that Iranian experts should make efforts to increase vehicle safety, improve fuel conservation, and reduce the end price of cars, and called upon universities and industrial institutions to increase their cooperation.